Politically correct leftists (you know, the “Hey, ho, hey, ho, Western Civ has got to go!” crowd) hate this book. They view it as nothing but unabashed imperialism or colonialist propaganda and think that is disturbing and offensive especially to say that elephants need clothes! Also, many feel that it is too frightening for children because the mother is killed and the old king dies of mushroom poisoning. First, this is a children’s fantasy where the elephants are anthropomorphized. No one thinks it strange that Peter Rabbit wears a coat and even talks, but heaven forbid that Babar wear clothes! That smacks too much of Western imperialization. Secondly, the deaths are no more graphic than that of Bambi’s mother. All Brunhoff says is, “Babar is riding happily on his mother’s back, when a wicked hunter, hiding behind some bushes, shoots at them. The hunter has killed Babar’s mother!” And there is no gory scene of blood all over the place and Babar’s mother on her back with her legs up in the air. Others object that Babar marries his cousin, but people have been legally marrying their cousins for years. If someone doesn’t like the book, fine, but don’t criticize it as bad literature. It is a cute, classic story. Jean de Brunhoff went on to write six more Babar stories before his death in 1937 from tuberculosis, including The Travels of Babar, our favorite which tells of his and Celeste’s honeymoon trip; Babar and His Children; Babar the King; and Babar and Zephir. Many, or perhaps all, of them have been published together in the Babar Collection. 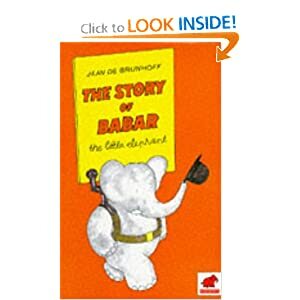 After his death, his son Laurent carried on the series with some 31 additional books including stories like Babar and His Cousin Arthur; Meet Babar and His Family; Babar and Father Christmas; Babar’s Museum of Art; Babar Comes to America; Babar’s Little Girl; and Babar and the Ghost; and educational books for little children such as Babar’s Book of Color; Babar’s Yoga for Elephants; Babar’s Counting Book; and Babar’s USA. We read many of these when our boys were small and enjoyed them.